I usually don’t post about products but have any of you used these? Casabella Premium Water Stop Latex Gloves (affiliate link – see my Disclosures page). I just discovered them and they are working wonders for the eczema on my hands that flares up periodically with the use of irritants like dish soap and hot water. But, what’s a city girl to do? The dishes have to be done. NYC apartment = no dishwasher. I can’t make the kids do the dishes yet. 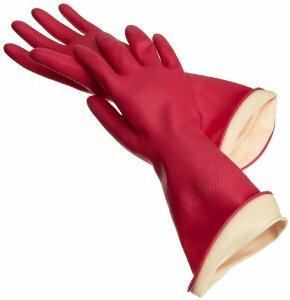 And the regular latex gloves from the store irritate my hands just as bad as dish soap with all those powdery linings. Well, guess what? These are wonderful! They have a “cotton flocking” which means that tiny cotton fibers have been adhered to the interior of the glove. Now, I will warn you that when I first got these and opened them up my first thought was, “These aren’t lined with cotton.” You see, I was expecting a cotton fabric lining and that is not what it is. It feels like a soft, less rubbery glove on the inside. I wasn’t sure that it was what I wanted but decided to try them out. I have been using them for around 3 weeks now and let me tell you the are well worth the $7 price tag. The lining (though not what I expected) doesn’t irritate my hands, they fit well and don’t slip and they have yet to crack or get a hole which is something that I can’t say for the gloves I used to buy at the grocery store. I’m sure they will wear out eventually but right now I am very happy and will definitely order more. They have definitely made dish washing a much happier chore at my house. Note: These are latex, so if you have a latex allergy I would avoid them since I don’t know that the cotton flocked lining would protect your skin sufficiently. This entry was posted in Cleaning, Home, Kitchen, Products. Bookmark the permalink.